I’m in Chicago and whilst here, found out about a new contest which turns out to be perfect for me and perfect for this place. I can’t tell you what it is yet, but I can tell you that I filmed myself in front of this monstrosity of a skyscrapper. It’s called the “Aon Center,” and it looks like the biggest prison ever. It’s one of the four tallest buildings in this city, the other 3 of which are lovely (Hancock Center, Sears Tower, Trump Intl. Hotel and Tower) but this one looks like it’s from the part of America’s past when we thought the way to beat Communism was to show them we could copy them, but do it bigger. Anyway, it seriously is big. 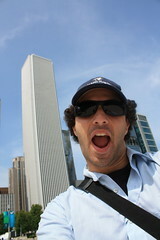 And, I am surprised to say, so are MANY of the buildings in Chicago. In fact, this is actually a pretty big city. I know I should know that, but I lived in New York and now I live in LA and I kind of assumed Chicago was like Dayton, Ohio but with a Sears Tower and a giant, filthy lake. It turns out, it’s a beautiful city with beautiful architecture and they even have a river! Who knew? !